Photos purporting to be Nokia's upcoming flagship device, the Nokia 8, have appeared online on My Nokia Blog. The photos aren't of the highest quality ever, but we can still gather a lot of information from them. This flagship Nokia has been known as the P1 until now, but following the official release of the mid-range Nokia 6 in China, the name Nokia 8 is entirely plausible. It's thought that the number 8 follows previous, camera-focused Nokia phones with 8 in the name: N8, 808 et al. One photo of the alleged Nokia 8 shows no front-mounted physical buttons, with all controls being onscreen instead. We haven't heard much about the design when putting together P1 rumours, other than a possible metal build and and IP68 water and dust protection. The leaked photos do show what looks like a metal build, and considering the Nokia 6 is metal, we fully expect the Nokia 8 to follow suit. There's no real way of determining the Nokia 8's water and dustproof credentials. There are more photos of the rear camera, which is a protruding circular module with what looks like a dual flash. The camera is said to be a 24-megapixel sensor with Optical Image Stabilisation and Super Electronic Image Stabilisation. 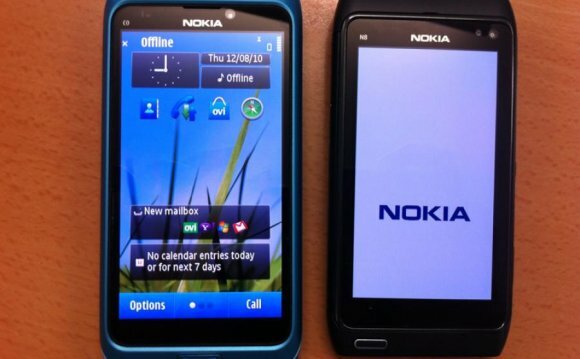 It's also believed to feature Carl Zeiss optics, carrying on Nokia's long-running partnership. Previous rumours have pointed to a 23MP camera, so this is pretty consistent. The camera module also has 'HRM' written on it, which, after a bit of searching online, could stand for High Resolution Monochromatic. Could there be a secondary camera to capture monochrome data like on the Huawei P9. The same photos have appeared on Slashleaks, along with some specs. Slashleaks says the Nokia 8 will come with a 5.7-inch Quad HD Super AMOLED screen, a 2.0GHz Qualcomm Snapdragon 821 or 835 processor with either 4 or 6GB RAM. There should also be either 64GB or 128GB of internal storage, a 12MP front-facing camera and dual front-facing speakers. We've already heard the Nokia 8 would come with a 5.5-inch QHD display, so while we can be pretty certain it will be of high-quality, we don't know exactly what size it will be just yet. And with Qualcomm's Snapdragon 835 processor expected to feature in many flagships phones in 2017, it's highly likely the Nokia 8 will make use of it too. While these pictures should obviously be taken with a pinch of salt for now, they do perhaps give us our first proper look at what we can expect from Nokia in 2017. We still don't know when Nokia will unveil the new device, but with parent company HMD Global having a stand at Mobile World Congress 2017 in February, we may not have long to see it. The scale of the tasks facing enterprises today is so vast, from equipment provision to the movement of capital and financial channels, that the enormous role of information technologies in the system of effective management and control of these processes and in the organization of business is obvious. Therefore, many businesses need NJ IT Tech Support. Information becomes the same basic resource as materials, products, services. Completeness and efficiency of information directly affect the accuracy of knowledge about current processes, and this, in turn, determines the effectiveness of decisions made by the entrepreneur.